A professional voice talent will take your content to the next level. Whether it’s e-learning, a company video, message on hold, radio and TV commercials, or anywhere else your business needs a voice, we can provide the right talent at the right price. 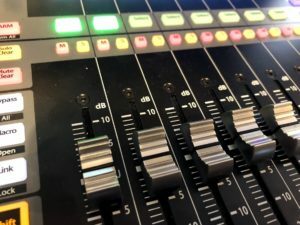 We have an impressive roster of hand-selected professional voice talents, some that come to the studio and some we bring in over high speed Internet audio connections. Your business and brand deserve the best. Let one of our professional voice talents bring your production to life! The studio owner Anthony has been a podcaster since the earliest days of the art form. In fact, he was one of the first “God-casters” back in 2005! When it comes to podcast production, we definitely know our stuff. From idea to completed production, and even uploading it for the world hear, Third Hour Media, LLC has you covered. Whether you need a commercial mixed and mastered for radio/TV, dialogue matched to picture, or anything else audio related to get your production to the finish line, we’re here to help.